BOSSASO (HOL) – Somalia’s semi-autonomous Puntland region on Friday unveiled a $40 million project for a rickety port’s reconstruction plan aimed at benefiting communities in the country’s northeastern part amid a new battle for foreign investment projects in the region stirred by UAE’s port investment in the neighboring breakaway territory of Somaliland. Garacad port’s reconstruction project by a Turkish construction firm, would also rebuild highways to allow easier access to the historic coastal town’s port which has once served as a major piracy hub for years before the end of Somalia’s once notorious sea gangs, thanks to the EU’s naval forces that brought an end to the menace that threatened the world’s international shipping lines. Unveiling the grand project, Puntland’s president Abdiweli Mohamed Ali Gas said that the reconstruction of the port which is expected to last two and half years would be undertaken with funds raised by local business communities. 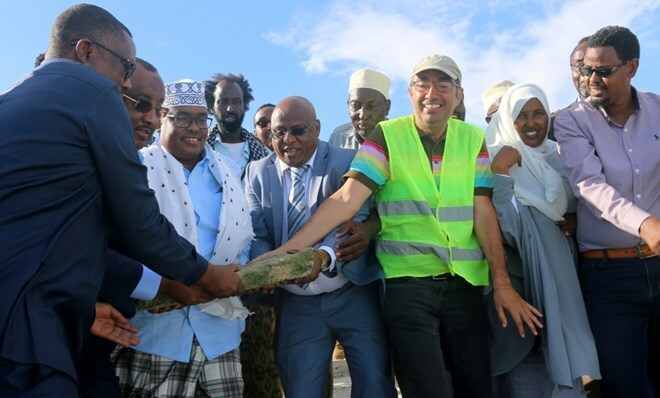 “Only one port cannot fulfill the needs for the entire Puntland people, therefore, the reconstruction of the Garacad port would further help in improving our economic infrastructures.” Ali said during a ceremony unveiling the project in the town on early Sunday, referring to Bossaso seaport. Mr. Ali said that once the construction of the 636m-meter port is completed it would ease the process of delivering goods to the coastal areas that have relied on land transport and Bossaso port to receive commodities from abroad. Among the port’s reconstruction plan is highway ramps that would help give vehicles and people access to the dockyard of the port, the second in the region which currently relies on its main seaport in Bossaso, the region’s commercial as its only point for direct access to the maritime transport. The project is also expected to help create job opportunities for the region which has seen increase in the rate of unemployment among its youth in recent years. It is estimated that 70% of the region’s 3 million population is under 30.